IBM and SAP Mobile asset management solutions offer you a quick, cost effective and reliable way to connect your people with your data, wherever they are. Mobile enterprise systems are the technological enabler that integrates the back-end enterprise asset management system with roaming networks through your chosen mobile device to send and receive high quality data between field personnel and the office. In an asset intensive enterprise, mobility strategy presents many challenges. Evolving technology and future proofing, security of enterprise data, ease of implementation and ongoing upgrade costs, seamless connectivity and a growing portfolio of applications to deploy are all issues that need to be considered. In order to select the right mobile asset management solution you need to develop an overarching mobile strategy. As asset management and mobility specialists Tolerro can assist you to tailor a future-proof mobilisation strategy, incorporating your asset management processes and strategic operational objectives. Tolerro is proud to be an SAP and IBM Business Partner and work with a variety of best of breed mobile solutions to deliver our customers objectives. This allows us to develop solutions that integrate with a wide range of Enterprise Systems. We can offer an end-to-end enterprise mobility management solution based on extensive industry knowledge and tried and proven mobility software. Finding you the most cost effective mobile solution to reach your strategic asset management goal, is our core objective. 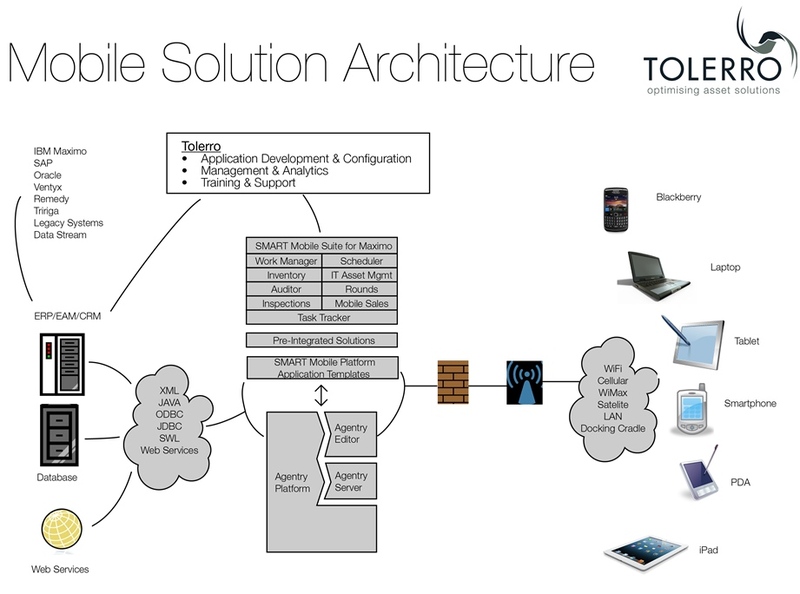 Tolerro can assess, scope, plan and implement your mobility solution. CALL 1300 730 722 to arrange your FREE Mobility Assessment Consultation. Manual paper-based asset management and work practices can slow you down and create unnecessary double handling of information and opportunity for errors and waste. Getting the right information at the right time to the right people will create a seamless efficiency that can make your organisation’s productivity soar! Make your asset management mobile with the IBM Maximo Mobile Suite and start reaping the benefits. IBM Maximo Mobile Suite provides remote access to the Maximo Asset Management processes for work, asset and inventory management. These applications are easy to use and versatile and allow your field personnel to perform work remotely by sending and receiving critical and complex information from their hand-held device. IBM Maximo Mobile Work Manager – streamline field based work processes through timely access to work orders, service requests and tickets; accurate asset and location information; historical details; attached documents; safety information and work plans. You can also add onto this application the Maximo Calibration product to record instrument readings and tolerance testing on-the-go. IBM Maximo Mobile Asset Manager – combines Maximo asset functions with an easy-to-use mobile interface allowing asset managers and auditors to perform tasks in the field. Includes creating and managing assets, locations, configuration items and collections; audit physical asset inventory; create and manage routes, rounds and collections; move and swap assets; generate maintenance and service requests and verify and update configuration and state of assets. IBM Maximo Mobile Inventory Manager – assists storerooms to manage, issue, receive and track inventory including RFID and bar code capability. Familiar functionality because it fully integrates with IBM Maximo as a single vendor tailored solution for Maximo users. Improve productivity from management to field personnel with instant access to remote and mobile asset data. Reduce travel time, paperwork, data entry and data errors, double handling and miscommunication. Real-time reporting, monitoring, job progress and improved first-time fix rates. Improved and streamlined business process management and regulatory compliance. Exchange data with the application server using the method best suited for your operating environment: real-time wireless, dial-up or docking cradle. Open flexible and scalable solution making configuration and deployment easy, supporting multiple hand-held devices and communication methods. Access to your asset information in the field can effectively reduce the number of tasks and personnel required to perform scheduled maintenance tasks. Become dynamic, seize more opportunities and gain greater efficiency by going mobile. Join the hundreds of organisations that have realised millions of dollars in benefits by choosing SAP Syclo. SAP Syclo is a mobile asset management application for organisations involved in operating, tracking, inspecting, auditing, and maintaining enterprise assets. It allows you to connect with your data wherever you are. SAP Syclo integrates with a wide variety of backend enterprise systems, including IBM Maximo, and accesses roaming networks to send and receive high quality data between field personnel and the office. Whether you use an executive Blackberry, iPad, laptop or tablet PC, SAP Syclo configures and deploys to your chosen mobile device. SAP’s Syclo’s Agentry mobile platform provides an easy to use yet fully scalable solution that enables you to integrate, develop, control and manage mobile applications that reach your geographic regions, user groups and numerous devices. You can have thousands of users and large data sets and also have fast synchronisation. Built on Syclo’s flexible Agentry is the Mobile Suite incorporating Work Manager; Schedule; Inventory Manager and Auditor. There are also other pre-integrated mobile products for Calibration; Inspections; Rounds and Task Tracker. Together the Mobile Suite and Agentry platform offer you a long term, cost effective mobile strategy and a ROI that will raise your performance. Working smarter means a better bottom line. In April 2012 SAP acquired the Syclo mobile application suite, now fully integrated into the SAP portfolio. Stay tuned – new brochures coming soon! 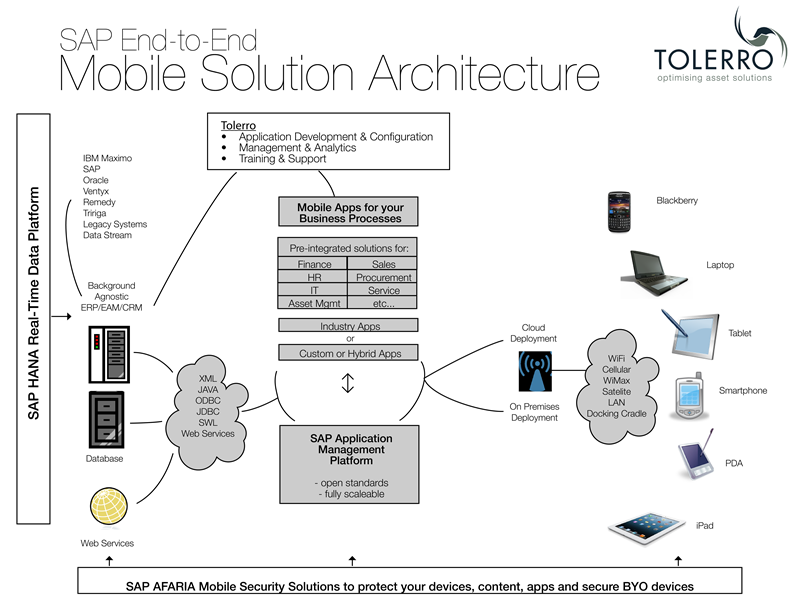 Enabling a winning mobile enterprise…. The post PC era is emerging fast and customers, employees, suppliers and partners are driving the need to mobilise business processes. Unwiring your business is a new imperative with a demanding set of new challenges. Enterprise Mobility Management (EMM) is evolving as a driving force and key enabler for greater productivity, reduced cost and lower total cost of ownership of enterprise resources. It can also be a costly if you don’t strategically approach its implementation. You need a manageable and scalable mobility strategy underpinned by a common mobility platform that is future-proof, whilst allowing you to quickly build and deploy applications to run your business operations on-the-go. This means you need to start with the big picture in mind while you scale up and mobilise the various operational functions throughout your whole enterprise. As business, technology, devices, regulations and your organisations change over time, it is important the mobile solutions you select are flexible. At the implementation level there are many challenges to evaluate including the selection and management of devices, the development, deployment and management of applications and the security solutions that protect your devices, content, applications and intellectual property. Future-proofing and scalability can only be managed by choosing experienced vendors and mobile specialists that have deployed solutions similar to your needs. This experienced proven track record means that you save time and money in scoping and executing your mobile strategy. That’s why we partner with SAP to deliver best-in-class mobile workforce solutions backed by futuristic innovation and technology where the sky is the limit. SAP Mobile Solutions are agnostic which means that even if you are not an SAP customer or have not invested in an SAP end-to-end solution, you can still access the power of their mobility platform and Mobile App Solutions. Tolerro can assess, scope, plan and implement your mobility strategy. We can assist you with part of a mobility solution or a whole end-to-end solution in partnership with SAP. As asset management specialists we have enhanced our expertise in mobilising asset management. Enterprise Asset Management (EAM) is combining with Enterprise Mobility Management (EMM) to drive a new highly streamlined strategic approach to traditional asset management activities. Many organisations start with their asset management operations and then scale up to other areas of the organisation from there. improve asset visibility and access high quality data in real-time to make better informed decisions. This means greater reliability and efficiency, and lower overall servicing and repair costs, ultimately leading to optimised performance and a better bottom line. Going mobile delivers real cost saving benefits. With stretched budgets, increased competition, greater risks and higher labour costs, it is essential to keep costs under control and achieve a higher return on assets. Give employees everything they need to efficiently and safely install, inspect, maintain, and repair assets in the field. Streamline routine condition monitoring, meter reading, and field measurements by recording more accurate data and analyzing it faster. Anticipate emergencies and outages with easy review of trend readings, points, and sequences. Accelerate decision making, optimize productivity, and improve quality with software that integrates 3D visualization of assets and business data. Enlist your entire workforce in maximizing employee safety by enabling them to quickly log issues directly into your environment, health, and safety incident management solution. Tolerro can work with you to use a combination of pre-integrated SAP EAM Apps with customisations to create a hybrid app that perfectly streamlines your work practices. As mobile workforce experts with an asset management specialisation, we can tailor a mobile solution to revolutionise your asset management activities. Call Tolerro TODAY to discuss your mobile workforce objectives. In April 2012, SAP acquired Syclo, the leading mobile enterprise solutions provider, to further strengthen and broaden the SAP portfolio of mobile applications. Tolerro was a long standing partner of Syclo and managed the first Syclo implementation for Facilities Management in Australia and the First Syclo Work Manager implementation for Transportation in Australia. We are now embarking on some exciting mobilising “firsts” as an SAP Channel Partner. We are looking forward to joining forces and expanding our depth and breadth of expertise in the mobile workforce solutions arena to deliver great outcomes for our clients. Accelerate your implementations, optimise your IT operations, and speed your business process innovation – with SAP Enterprise Support. This powerhouse collection of support tools and services is built on a global pool of unique expertise gained from over 40 years of working with you – our customers. This video is examines the UK National Grid Implementation of SAP Syclo to send work out to field personnel. Outlines measurable productivity gains and staff reactions post implementation.